Captain America | Robert Mitchell Jr.
I’m trying to eliminate all swearing. So I enlisted the help of Captain America. As you can see by the picture on the right, I now have a Captain America swear jar (a.k.a. “piggy bank”). 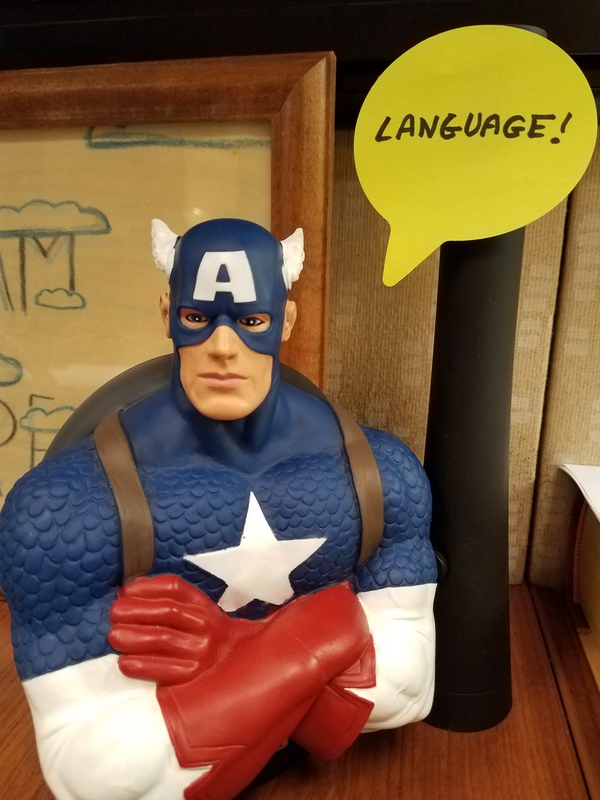 And thanks to Post-it® Speech Bubble Notes and my desktop flashlight to hold it up, Cap has his eye on me. Why Cap? Because everybody knows that, although he doesn’t like foul language, he sometimes slips up (just like me). Wish me luck in my quest. And, just for fun, here’s a recap of Cap’s complicated relationship with swearing.